Yellow Mountain Green Tea Products. This herbal supplement improves tranquillity by reducing a person's tension and moodiness. Take 8 (small Pellet size) pills, 3 times a day. This herbal supplement is used to strengthen the immune system and balance the energy system. Take 8 (small Pellet size) pills, 3 times a day. This herbal supplement is formulated to assist women with menstrual discomforts. It may increase kidney (hormone) balance, remove hot flashes, nervousness. Take 8 (small Pellet size) pills, 3 times a day. This herbal supplement is formulated to strengthen the immune system to reduce swollen ankles. Take 8 (small Pellet size) pills, 3 times a day. This herbal supplement is formulated to improve daily circulation, menstrual discomfort, and energy (QI) of females. Take 8 (small Pellet size) pills, 3 times a day. This herbal supplement is formulated to support energy (QI) of the adrenal glands minimizing uncomfortable changes in a women's body from menopause. Take 8 (small Pellet size) pills, 3 times a day. This herbal supplement is increasing a person's energy (QI). Take 8 (small Pellet size) pills, 3 times a day. This herbal formulation is formulated to promote brain-metabolism, concentration and memory. This herbal supplement is formulated to promote the function of eye sight by removing toxins. This herbal supplement is formulated to reduce dryness of the eyes and improve vision and clarity. This is a refined product with over 100 minerals and vitamins made from the extract of 100% wild mythic fungi which contains Red, Green, Yellow, Black, and Purple mythic fungus collected from the wild forest. The five colors of Lingzhi mixed together works directly on the five organs of the body (Liver, Heart, Digestive system, Lungs, and Kidney). For thousands of years Chinese have used this combination for people suffering from cancer and chronic disease. 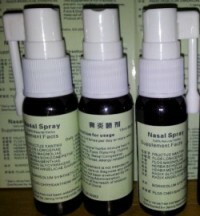 Our Herbal Nasal spray is a natural herbal product. It will relieve sinus headache, runny nose, sneezing, itch watery eyes, pollen allergy. Box. We also have a large supply of Flu herbs, both in tea and pill form, green tea, and cancer herbs both in tea and pills. *To be Used as a Dietary supplement Only. See Footnote Below. * This supplement has not been evaluated by the FDA, and is not intended to treat or cure any disease.